I include a fresh organic green juice or smoothie in my diet every day! I like to make my fresh juice for a week at home and vacuum seal in the nutrients. Juicing at home is a great way to save money and a great activity to do with kids. Whats the trick to a good juice or smoothie? THERE ISN’T ONE! Get creative! Play with your food! Try something new like dandelion greens or maca root powder! You don’t have to use my recipe, but it’s a good place to start. Play with the ingredients until you find a recipe you love! Remember separation is normal. If you have a good recipe, share it with everyone below in a comment. 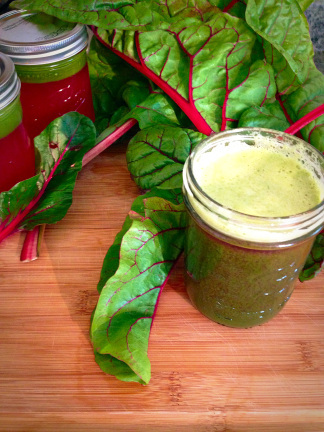 This is my favorite juice recipe made fresh with organic vegetables from my Grandma’s garden. All ingredients are always organic!